Rabe-Hesketh and Skrondal (2012) analyze data on lip cancer in Scotland. The data consists of the number of cancer cases observed in each of 56 counties in Scotland in 1975-80. 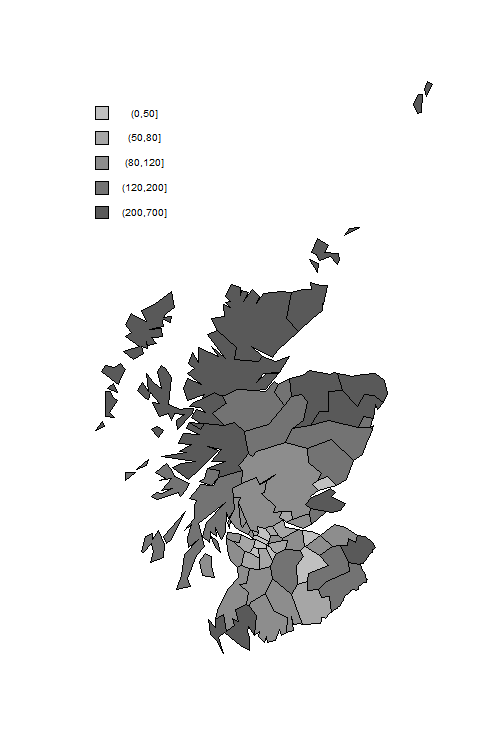 We also have information on the expected number of cases in each county, based on age-specific lip cancer rates for the whole of Scotland and the observed age distribution in each county. The ratio of observed to expected counts, often times 100, is called the Standardized Mortality Ratio (SMR). For example a value of 193.2 denotes almost twice as many cases as expected. A limitation of the SMR is that estimates for counties with small populations are very imprecise. To address this problem we will use Empirical Bayes (EB) estimates based on a random-intercept Poisson model. over-dispersion. Log likelihood = -181.32325                     Prob > chi2       =          . The next task is to plot the empirical Bayes estimates of the SMR. An annotated do file to produce the map can be obtained from the Stata bookstore, copied to your working directory, and then run. The first thing the do file does is read the map polygons, which will replace the dataset in memory. We first download a file from the Stata bookstore with the map polygons. We then prepare a canvas with the right dimensions, draw the polygons for each county with a fill color to reflect the SMR, and add a legend. The incidence of lip cancer is higher in coastal places, particularly in the north. You may also want to plot the EB estimates versus the observed SMRs. You will see the usual shrinkage towards the mean, which is about 145.